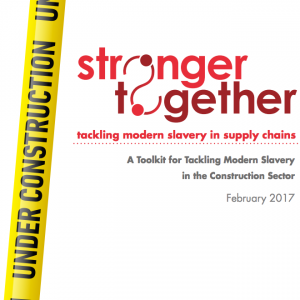 This toolkit is the result of a collaboration between the Chartered Institute of Builders and Stronger Together. It provides guidance and good practice for responsible employers and labour providers operating in the construction industry. Its aim is to support businesses set up their own policies to safeguard against human trafficking in their workforce, on sites, and in subcontracted organisations and labour providers. This report presents findings from research to create an evidence‐based typology of modern slavery offences in the UK. The research sought to devise a typology of modern slavery offences to improve the government's understanding of the different ways that modern slavery manifests in the UK and to inform tailored policy and operational responses. The typology, which is based on analysis on 328 confirmed cases of modern slavery in the UK, identifies 17 types of modern slavery offences setting out the characteristics of the victims, offenders and offences involved for each type. 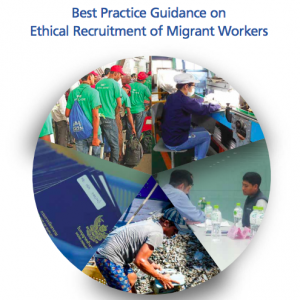 This Framework offers a checklist guide of specific Standards of Ethical Practice for firms involved in cross-border recruitment of workers, and outlines a Verification and Certification System designed to protect workers against specific patterns of vulnerability and abuse. 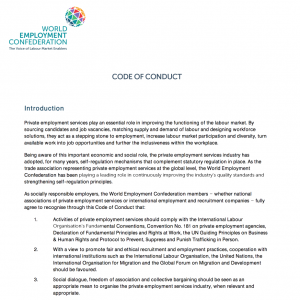 The SEP include: - a checklist of operating rules for firms engaged in the cross-border recruitment and movement of workers The VCS outline includes: - an outline of elements and principles to be adopted by organisations that wish to measure, certify, and ensure compliance of particular enterprises with the SEP The Framework also details a list of recommendations which are informed by ManpowerGroups’s pragmatic experience in responsible cross-border recruitment of workers, and Verite’s expertise in creating verification systems to protect human rights. 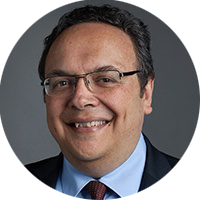 It is intended as the first phase in a three-phase project, the second phase is a demonstration project with interested groups, the third phase is the development and dissemination of results, assessments, further recommendations and supporting materials for the wider replication and adaptation of the Framework. 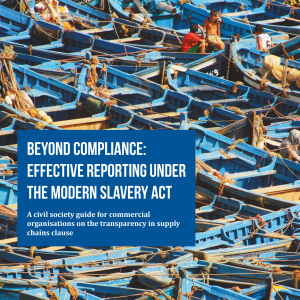 Verite have published guidance on establishing an effective and transparent system to protect against modern slavery in supply chains. It details both in-company and site-level guidance. 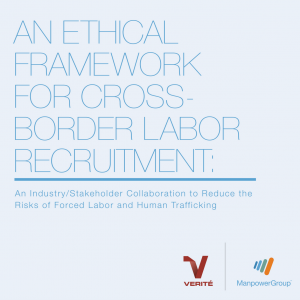 The criteria provided are intended to be used by any organisation to help design a system for preventing human trafficking within business operations and the supply chain. Each authentication criterion is accompanied by examples of leading practice and verification evidence. The Ethical Trading Initiative (ETI) is an alliance of companies, trade unions and NGOs that promotes workers' rights around the world. 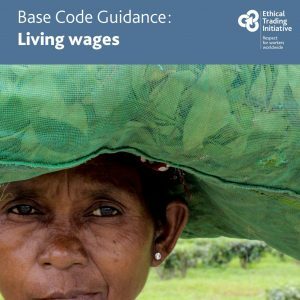 Through this guide, they share what companies can do to create the enabling conditions for the payment of living wages, in line with their commitment to the ETI Base Code. They outline their expectations of ETI members and provide guidance on winning senior executives’ support for living wages. The guidance includes practical steps for developing living wage strategies and collaborating with stakeholders to identify sustainable, scalable solutions. It also covers the vital question of how to offset the cost of increased wages, and includes the experience of ETI members. The ICCR is a coalition of faith-based investors. This guidance looks at emerging best practice trends in eight companies from high risk sectors, analysing their developments in corporate ethical recruitment policies and identifying gaps for improvement. The key learning points provided in the guidance can be used as a starting point for businesses to develop their own policies. 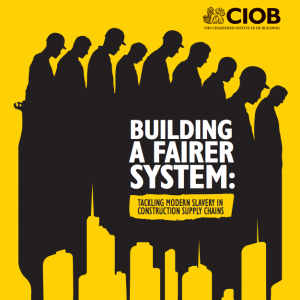 This report, published by the Chartered Institute of Building, calls for industry collaboration to eradicate modern slavery in supply chains, procurement and migrant labour. 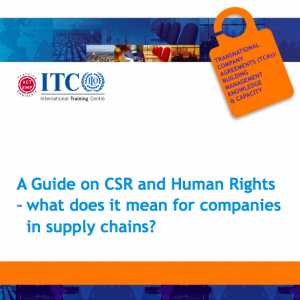 It offers many recommendations to companies within the industry which are also highly relevant to the hotel industry including guidance on supply chain mapping, corporate policy, training, navigating potential risks with third party agencies, and collaborating with NGOs and government. 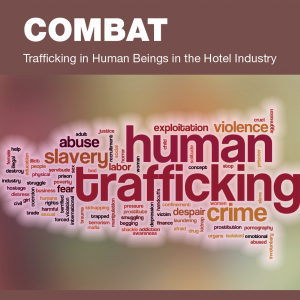 The COMBAT Toolkit is designed specifically to help hotels tackle the problem of human trafficking by helping staff to identify specific signs of trafficking. It comprises reference guides with accompanying powerpoints, case studies with accompanying powerpoint for training sessions, a trainer's manual, a series of 10-minute trainers, aide memoires and example awareness-raising posters. The aide memoire is a physical prompt that can be distributed to all hotel staff and employees, to remind them of the signs of trafficking and how to report it. The COMBAT Toolkit is designed specifically to help hotels tackle the problem of human trafficking by helping staff to identify specific signs of trafficking. It comprises reference guides with accompanying powerpoints, case studies with accompanying powerpoint for training sessions, a trainer's manual, a series of 10-minute trainers, aide memoires and example awareness-raising posters. These three case studies about sexual exploitation are written in the first person, so that trainees are better able to identify with victims. These case studies are intended to provide discussion point for trainees to identify whether or not the case is an example of human trafficking, what signals there are if so, and what barriers could be erected to prevent this example from happening in their hotel. The COMBAT Toolkit is designed specifically to help hotels tackle the problem of human trafficking by helping staff to identify specific signs of trafficking. It comprises reference guides with accompanying powerpoints, case studies with accompanying powerpoint for training sessions, a trainer's manual, a series of 10-minute trainers, aide memoires and example awareness-raising posters. COMBAT's seven case studies are written in the first person, so that trainees are better able to identify with victims. These case studies are intended to provide discussion point for trainees to identify whether or not the case is an example of human trafficking, what signals there are if so, and what barriers could be erected to prevent this example from happening in their hotel. The COMBAT Toolkit is designed specifically to help hotels tackle the problem of human trafficking by helping staff to identify specific signs of trafficking. It comprises reference guides with accompanying powerpoints, case studies with accompanying powerpoint for training sessions, a trainer's manual, a series of 10-minute trainers, aide memoires and example awareness-raising posters. These example posters can be reproduced and distributed around hotels to raise awareness of human trafficking and encourage reporting via appropriate channels. They come from a range of campaigns (some non-English) and are intended for back-of-house display to hotel employees.